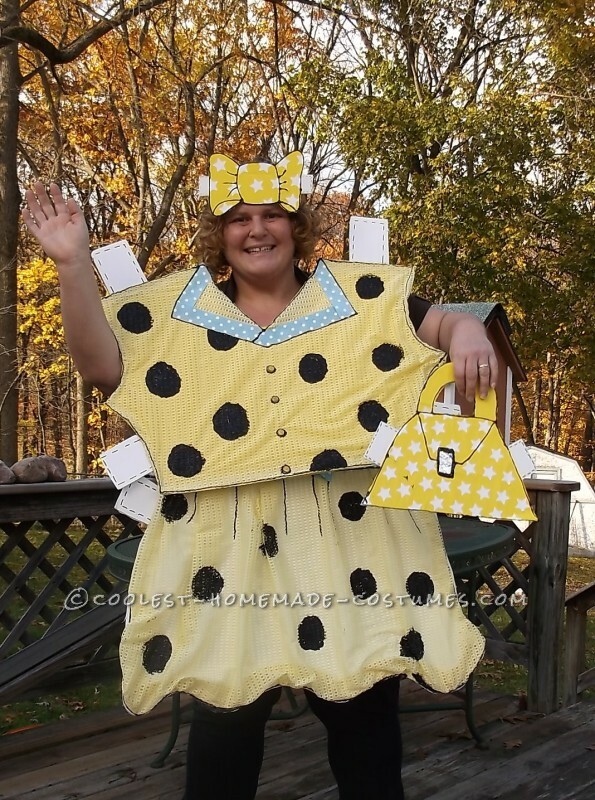 I googled unique costume ideas and after seeing images of paper doll costumes that were made with poster board and then painted. I really liked the idea but felt it was a bit bland. I was determined it could be some much more wonderful if the details were expanded and tweaked. My initial vision was to use scrap book paper and accessories. I pawed through my hoard of supplies and was finding little to satisfy my Halloween spirit! Even after searching my local store craft departments I was coming up empty handed. My motivation to create this costume continued to grow, I turned to my linen closet. 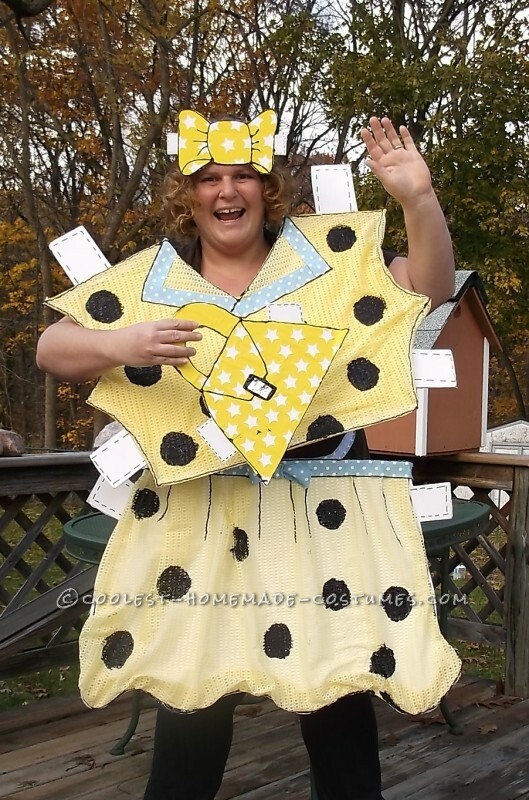 I knew by this time I wanted my paper doll costume to be like no other- as life like as possible. Those were the details that I felt needed to be expanded. My entire life I have loved Halloween and I even had a “Hallowedding” ! I have always held myself to a higher standard when it comes to producing my costume. I purchased 3 sheets of foam board and crudely traced my own body onto 2 of the foam board sheets. Once I had traced myself, I drew a cartoonish style dress large enough to cover my figure. I was on a creative roll once the dress pattern was penciled out,(including the paper tabs) & cut away from the foam board with a utility knife. I shook out a shower curtain I bought years ago but never used and plugged in the trusty hot glue gun. I was so surprised on how quickly things progressed from that point. I thought to start at the bottom of the skirt to ensure enough material to allow me to make ruffles and hopefully result in a flowing effect on such a ridged surface. I was pleased with the skirt and thought to add a subtle difference to the shirt. Using yellow wrapping paper and glue stick I made the shirt plain yellow. When I completed that; I felt the difference in texture was to noticeable. I turned to my shower curtain and hot glue gun again. Just as I did with the skirt, I glued only at the edge of the foam board except I pull the material to fit perfectly. I was excited and impressed but not finished! I found a wide ribbon in my supplies, I made a belted bow for the skirt and accented the neckline of the shirt. The cute ribbon was a perfect touch and opened my eyes to other needed details and sparked my ideas on how to actually wear this costume. I was digging through craft supplies again. I knew I had a bottle of black puff paint, I just had to find it! As you can see, I found it and Voila! My masterpiece was coming together beautifully. I drew along the edges of my costume and areas I had hope to add definition with black lines with the puffy paint. I am not joking when I say 4 cups of coffee and puffy paint are not a good combination. I had some pretty irritating flubs due to shaky hands plus a few stray drops of paint. Determined to camouflage my errors and added the adorable giant black dots with the puffy paint. I loved the effect and was compelled to add matching buttons outlined in the puffy paint to the shirt. The question of how to wear the costume was clear by this point but I had to wait for the puffy paint to dry, the thought of stopping was torture. I grabbed the 3rd foam sheet and drew out a small purse and a not so small hair bow; both with the signature paper doll tabs. I glued the same yellow wrapping paper to my 2 accessories after cutting them out with a utility knife. Like the outfit they were super cute but lacking a bit. I used a star paper punch and went to town! I glue them on with a glue stick. I grabbed an elastic headband from the bathroom and stapled it to the back of the bow and slid it on my head. It was amazing, I was so proud. Still I was not finished, I add the puffy paint to my accessories to give them the same cartoon effect as I did with the skirt and shirt. all that was left to do was wait for the paint to dry so I could add velcro to the back of the skirt, I was going to use the remaining ribbon to make an actual belt for my waist that would have velcro on it as well. For the shirt I needed to hot glue loops near the shoulders. My trusty mitten clips were called to duty again. I have used these for several costumes in the past and were exactly what I need for the shirt. My vision was accurate, the velcro belt and mitten clipped top allowed me to remove my costume quickly when needed, I work at a daycare and have to get on my knees a lot to help little ones. Plus on Halloween my dog wore his costume to pass out candy, and I had to be able to pick him up if he were in the way; my costume as fabulous as it was made picking things up challeging. I felt like a T-Rex with such limited reaching ability but it was worth it! 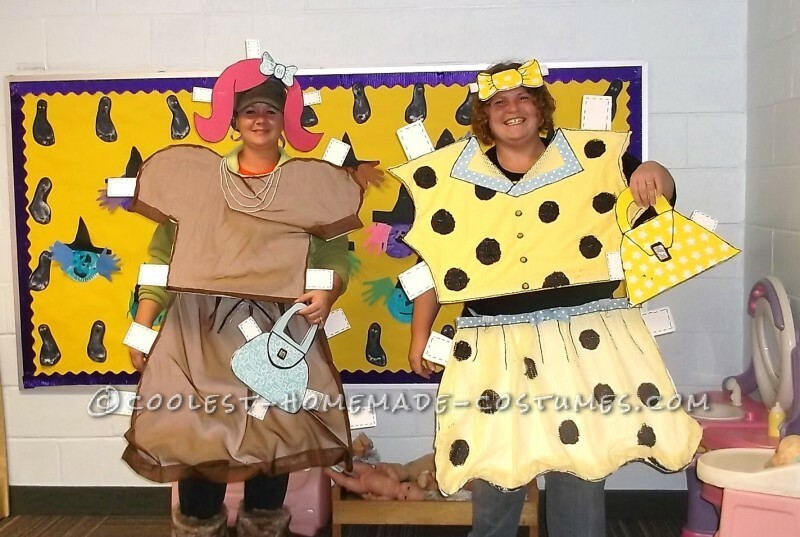 I am entering the single adult costume contest but have included a 3rd image of myself and a coworker. The entire staff at the daycare decided to be minions from despicable me. I am a huge fan of the movie but could not commit to such a popular idea. Halloween as I mentioned before is a great source of pleasure for me and a fun creative outlet I look forward too all year. I also work the closing shift at the daycare, this meant that 10 staff member were going to be working all together as minions- super cute! I work with only 2 other staff member and 1 stays for only an hour. I told my staff members, “I am going to be a paper doll. NO ONE KNOWS, it is a secret. If you don’t want to be a minion you can be whatever you want, including a paper doll.” The girl who works with me the entire shift was having trouble decided and couldn’t really envision the paper doll costume. When I was at a stand still in the process of making mine, I sent her a picture. Her response was, “Oh my goodness! Can you make me one?” I said of course and told her the supplies I would need. She ended up give me money to pick up the supplies for her costume. I spent another 5 hours making her costume and personally felt hers turned out much better but I am often my own worse critic! I used all the same steps to make hers except did not add the puffy paint. I though the material I chose for hers (an old sheer curtain panel) would loose its elegant look with the puffy paint accent. She said several times how much she loved her costume. Her 2 boys seemed to be as equally excited and told me the day after I gave it to her that their dad said it was awesome. I also wanted to include the picture of us together because we do look outstanding, if I may say so myself!